"Eating a vegetarian diet can be very healthful and rewarding. 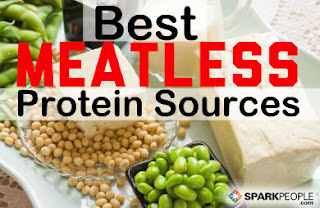 However, most vegetarians—including soon-to-be vegetarians and their meat-eating loved ones—are concerned about getting adequate protein. Most people are accustomed to getting protein from meat, but what else contains protein? Aren't plant-based proteins "incomplete" or lower quality? Nuts provide a good dose of protein along with some heart-healthy fatty acids and antioxidants (vitamins A and E). They are also packed full of fiber. Take your pick! Many nuts have a significant source of protein ready to work for your body. Peanuts, almonds, pistachios, cashews, and pine nuts are among the highest in protein, while chestnuts and hazelnuts, although they do still have some protein, are the lowest. Think out of the box when you’re adding nuts to your diet. They can be grated, toasted, ground or eaten raw and are great when combined with salads, wraps, soups and stews and baked goods. But pay special attention to portion size! Nuts are a great source of many nutrients, but do come with a hefty dose of calories, thanks to the healthy fats they contain. A single serving is just 1 oz! Many nuts are best when stored in a refrigerator, which helps keep their fats from going rancid (for up to 6 months). Seeds are another great way to grab a few grams of protein and many other nutrients. Healthful unsaturated fats, as well as phytochemicals, make seeds a powerhouse for heart disease and cancer prevention. Just a quarter cup of pumpkin seeds (also called pepitas) has 8.5 grams of protein. Add this amount to a salad or eat them plain for a quick snack. Sunflower seeds are easy to add to pasta or salads, or sandwich wraps, while sesame seeds are easily ground and sprinkled onto steamed veggies for a protein dusting. Dried peas, beans and lentils belong to a group of food known as "pulses" or "legumes." Aside from soybeans, these plants have a very similar nutrient content, which includes a good dose of protein. On average, they have about 15 grams of protein per cup, and tagging along with the essentials protein are fiber and iron. Adding beans, lentils and dried peas to your meals is a great way to replace meat (a beef burrito can easily become a black bean burrito, for example) while still getting your much needed protein. Add pulses to soups, salads, omelets, burritos, casseroles, pasta dishes, and more! Make bean dips (such as hummus, which is made from garbanzo beans, or black bean dip) to spread on sandwiches and use as protein-packed dips for veggies or snack foods. Soybeans are a complete protein that is comparable in quality with animal proteins. Eating soybeans (and foods made from soybeans) has been growing trend in America for only five decades, but this protein-rich bean has been a staple in Asia for nearly 4,000 years! This plant powerhouse is used to create a variety of soy-based foods that are rich in protein: tofu, tempeh, textured vegetable protein (TVP, a convincing replacement for ground meat in recipes), soymilk and "meat analogs," such as vegetarian "chicken" or faux "ribs" are all becoming more popular as more Americans practice vegetarianism. To learn more about using tofu, read Tofu 101. To learn how soy may impact your health, click here. In a culture that focuses largely on wheat, it's easy to overlook the many types of other grains available to us. Some of these grains are very high in protein and can be included in your diet for both whole-grain carbohydrates and muscle-building protein. Quinoa is unusually close to animal products in protein quality, making it an excellent grain to replace white rice or couscous. It can also be cooked and mixed with honey, berries and almonds in the morning for a protein-packed breakfast. Other grains high in protein include spelt, amaranth, oats and buckwheat. Choose whole-grain varieties of cereals, pastas, breads and rice for a more nutritious meal. If you consume milk products, dairy is a great way to add some extra grams of protein to your day. Low-fat milk, cheese and yogurt are easily accessible, quick to pack and fun to incorporate into many meals and snacks. Whether you’re drinking a cup of skim milk with your dinner or grabbing some string cheese before you run errands, you can pack about 8 grams of protein into most servings of dairy. You’re also getting some bone-building calcium while you’re at it! Keep in mind that low-fat varieties of milk products are lower in calories and fat, but equal in calcium to the full-fat versions; low-fat varieties may also be higher in protein. Eggs contain the highest biologic value protein available. What this means is that an egg has a near perfect combination of amino acids within its shell; when assessing protein quality of all other foods (including meat), nutrition experts compare them to the egg. This doesn’t mean that all other sources of protein are less healthful or less important but does mean that an egg is an awesome way to get a few grams of protein. At 6 grams for one large egg, there are endless ways to add it to your diet. Salads, sandwiches, breakfasts or snack—an egg can fit in anytime! As you can see, protein is EVERYWHERE in our diet, and even without meat you can get enough every day; you just have to look in the right places! For more ideas for using these various plant-based proteins, check out our dailySpark series, Meat-Free Fridays for recipe and cooking ideas! Various nutrient profiles from The World's Healthiest Foods (WHFoods.com)"